Abstract. Background: Gender is often related to different life stressors and mental health disorders, but a limited amount of research examines risks of suicidal ideation of probationers by gender. Aims: The aim of this study was to examine gender differences in suicidal ideation of probationers. Method: Using a national sample of 3,014 male and 1,306 female probationers with data from the National Survey on Drug Use and Health (2009–2011), multivariate regression analysis was conducted. Results: Male and female probationers display similar demographic characteristics although their life circumstances and experiences seem different. Female probationers in the study were more likely to experience financial, psychological, and residential stressors than male probationers were. Female probationers were also more likely to have received medical and/or psychiatric treatments. Female probationers were exposed to more suicidal ideation risks than male probationers were. Additionally, no protective factors to suicidal ideation were found for female probationers. Conclusion: The findings suggest that a gender-specific approach to suicidal ideation of probationers may lessen the prevalence of suicidal ideation of this largely neglected population. Cross-national prevalence and risk factors for suicidal ideation, plans and attempts. Suicide is a leading cause of death worldwide; however, the prevalence and risk factors for the immediate precursors to suicide - suicidal ideation, plans and attempts - are not wellknown, especially in low- and middle-income countries. To report on the prevalence and risk factors for suicidal behaviours across 17 countries. A total of 84 850 adults were interviewed regarding suicidal behaviours and socio-demographic and psychiatric risk factors. The cross-national lifetime prevalence of suicidal ideation, plans, and attempts is 9.2% (s.e.=0.1), 3.1% (s.e.=0.1), and 2.7% (s.e.=0.1). Across all countries, 60% of transitions from ideation to plan and attempt occur within the first year after ideation onset. Consistent cross-national risk factors included being female, younger, less educated, unmarried and having a mental disorder. 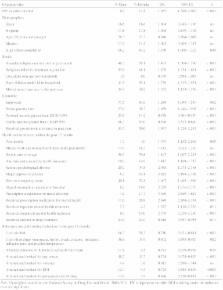 Interestingly, the strongest diagnostic risk factors were mood disorders in high-income countries but impulse control disorders in low- and middle-income countries. There is cross-national variability in the prevalence of suicidal behaviours, but strong consistency in the characteristics and risk factors for these behaviours. These findings have significant implications for the prediction and prevention of suicidal behaviours. Suicide in England and Wales and in Scotland. An examination of divergent trends. Factors predicting suicide in psychotic patients.